Τοποθετημένο στην υπέροχη περιοχή της Ουμπούντ, το Masia Villa χαίρει μιας επιβλητικής θέσης στη περιήγηση σε αξιοθέατα, σπα, πολιτισμικά αξιοθέατα κεντρικό σημείο της Μπαλί. Από εδώ, οι επισκέπτες μπορούν να έχουν άμεση πρόσβαση σε όλα όσα η πόλη έχει να προσφέρει. Με την βολική του τοποθεσία, το ξενοδοχείο προσφέρει εύκολη πρόσβαση στους προορισμούς της πόλης που πρέπει οπωσδήποτε να δείτε. Το Masia Villa προσφέρει επίσης πολλές εγκαταστάσεις για να εμπλουτίσετε την διαμονή σας στη Μπαλί. Τα δωρεάν WiFi σε όλα τα δωμάτια, 24ωρη φύλαξη, ημερήσιος καθαρισμός, κατάστημα δώρων/σουβενίρ, ιδιωτικό τσεκ ιν/τσεκ άουτ είναι μόνο λίγες από τις εγκαταστάσεις που κάνουν το Masia Villa να ξεχωρίζει από τα άλλα ξενοδοχεία στην πόλη. Οι πελάτες μπορούν να επιλέξουν από 8 δωμάτια καθώς όλα διαθέτουν μια ατμόσφαιρα απόλυτης αρμονίας και γαλήνης. Είτε είσαστε λάτρης της γυμναστικής είτε ψάχνετε έναν τρόπο να ηρεμήσετε μετά από μια δύσκολη μέρα, θα σας ψυχαγωγήσουν καταπληκτικές δραστηριότητες όπως οι σνόρκελινγκ, εξωτερική πισίνα, σπα, μασάζ, παιδική πισίνα. Έξοχες υπηρεσίες και μια εξαιρετική τοποθεσία κάνουν το Masia Villa την ιδανική βάση από όπου θα απολαύσετε την παραμονή σας στη Μπαλί. Our room was beautiful and we loved the outside bathroom. The grounds are also beautiful as are the views of paddy fields. We'd asked for a quiet room but were put in the one closest to the pool, reception and restaurant . The staff are lovely and will take you to and from central Ubud by scooter whenever you need to - just a short ride through the lanes. However I became very sick after my first night in the hotel - presumably after eating in the restaurant. Although the hotel manual said to tell the staff if you need a doctor, they all were all unable to understand me when I mentioned my sickness. On my first night I ordered beef rendang and I have to say it was disappointing - tough beef and not at all spicy. Breakfast was ok for my daughter but as I was so sick I ate very little and for a few days after leaving. The afternoon tea was a nice touch. Nice hotel but it's probably best to eat elsewhere, sadly. The room and outdoor shower area were beautiful. Each villa has a lovely front porch and they will bring your breakfast and afternoon tea there if you like! Great pool area and lobby. We absolutely loved our stay there - just a tiny bit outside of all the hubbub that is now Ubud. The possible downside for some is that you need to walk the final part or get a scooter up there (somehow they managed to cart us up there with our suitcases!) We don't mind walking but it's something to consider. We would recommend if you want a peaceful, relaxing stay in Ubud. Set amongst the lovely rice fields this is a relaxing and friendly place. A little hard to find and not accessible by car (walk or motorcycle) the staff were always happy to drop us at the Main Street. Only a 700 metre walk to central Ubud but feels like you are out of the hustle & bustle & in beautiful surrounds. Extremely helpful staff and peaceful setting in the rice fields. No car access but easy and cheap to get a motor bike taxi from town or arrange a pick up time when the staff drop you off. Would definitely stay here again. We were worried that we had a lot of luggage and the transfer would be complicated, also with 2 children, but rest assured the staff at the villa will take care of everything for you. They transferred all our luggage on scooters, communicated with our driver for a meeting point and everything ran smoothly. Every time we wanted to go to town it was never a problem and we never had to wait. They drop you at Starbucks in central Ubud, a perfect location. Extras beds available for children at a reasonable price. Breakfast was nice and can be served in restaurant or on your beautiful terrace overlooking rice paddies. Also they serve dinner, and there are other villas nearby where you can eat dinner if you don't feel like going to town. This location is beautiful and you will not regret staying here, 5 nights was not enough! Was really wowed by this hotel. Exceptional value for money. 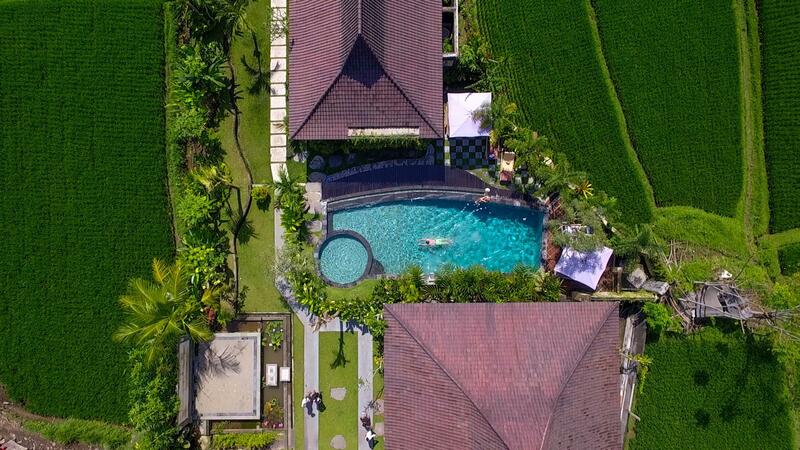 Located amongst rice fields, 10 minutes walk from centre of Ubud. Free shuttle by hotel staff on scooter into heart of town.......great fun! Really added to experience. Hotel consisting of eight modern, stylish, clean bungalows. Four poster bed with mosquito net and open air shower. Could not believe the value for money.....a real treasure! Restaurant was very good and reception very friendly and helpful. Pool small but clean. Afternoon tea and cake every afternoon on own balcony. Only gripe, tea things were not cleared away one evening and noisy cockerels in the morning. Apart from this oversight and unavoidable cockerels......... exquisite. Want to return to this idyll. Very helpful staffs beautiful rice paddies but that’s all. Villa has water damage on most walls and a mouldy smell upon entry, walls are super thin not suitable for light sleeper / children who doesn’t want to hear people making out till 3 in the morning. If you are looking for a quiet, peaceful and picturesque place to stay, away from the busy central streets of Ubud, then Masia is a great place to be. Lovely room sized villas amidst paddy fields, with a nice bathtub overlooking the sky. Clean! On a clear day, you can see Mount Agung from the restaurant where your breakfast can be served. I have no complaints on the quality of the food in the restaurant and dined there many times. Staffs are great, polite and certainly very helpful. The access road to the villas are not accessible by cars. Masia provides free motorbike transports to the nearest car park or Starbucks at Central Ubud, which takes less than 5 minutes. You can also choose walking to Ubud through the idyllic paddy field paths and tranquil narrow lanes, and you can reach Central Ubud in 15 - 20 mins. The pool is a bit small, but quite alright for me. We loved it. Masia Villa is a lovely place to stay in Ubud - quiet, out of the busy areas, and with lovely views of the rice padis. 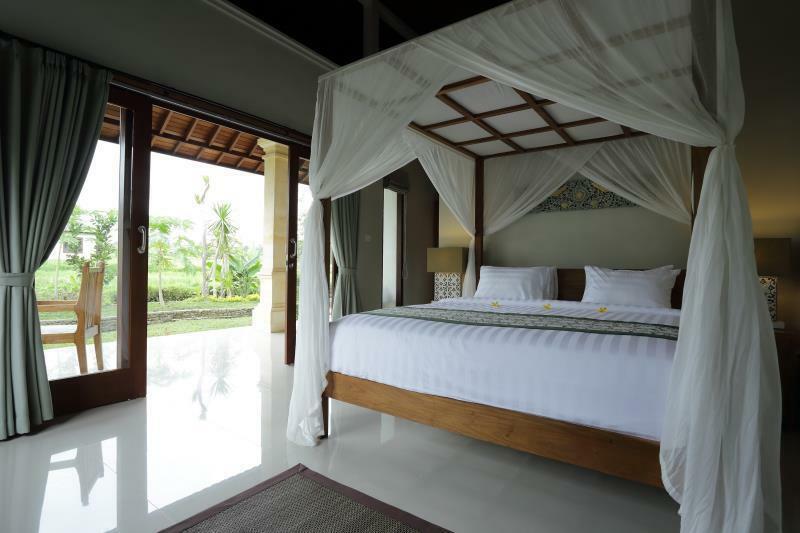 The staff is most accommodating, and will take you from the Villa down the road to the center of Ubud. This is important because without this transport it would be a nice but longish walk up a trail which is too small for cars! It was pleasant during we stay there. The foods for lunch, dinner or included breakfast is very nice and delicious. The veggie omelette is very delicious!!! Please don't miss out the welcome drink, very very nice. The hotel is near to the center but hotel is on top of the hill not accessible by car. However the staff can come pick you up and drop you anywhere in Ubud so there is no pb! Because it is not that accessible, the place is very quiet and nice in the middle of rice field. The villa is really nicely decorated and clean. They can serve you breakfast at the desired time directly at your terrace's villa. Staff is helpful and kind. I highly recommend Masia which is located in a rice field within a walking distance about 10-15 mins of Wubu shopping area so that you don't need to sacrifice the convenience but enjoy a quiet environment. They also provide a scooter pick-up service at any time in case that you have luggage or don't want to take a walk. The view in front of the room is great and the food is delicious. In particular, the staff is very friendly and helpful. My wife lost her purse in the room when we checked out, but the staff found it and gave it back to us. A very nice experience. I definitely will choose to stay Masia if I visit Wubu again. This place is very relaxing for a family of four. We enjoyed our motorbike pick-up from Ubud Centre, our room with an outdoor bathtub, and our set breakfasts. Its a beautiful stay. All staffs were friendly and very accommodating as well. Tips: Make sure to tell the receptionist your requests (like early takeout bfast and/or motorbike to the city centre which can take about 3 mins) We’d definitely book this villa the next time we visit Ubud. Everything was great - location, staff, facilities, room, cleanliness, restaurant and food. Try the 'Ubud Cooler' - great welcoming drink. Staff were extremely nice. Only con was that the fact the bungalows are semi detached and you can hear your neighbours through the timber ceiling (not the concrete wall) very clearly. I stayed here with my friends for 3 nights. I absolutely love everything in Masia Villa! The interiors of the entrance, lobby, and the room are really beautiful. You'll really feel the relaxing Balinese vibe. You get a really nice view of the rice paddies from your room. The breakfast was superb and you get to choose if you want American, Balinese or Continental breakfast. The staff are also very friendly, courteous and helpful. You'll also get a free motorbike ride to central Ubud and back to the villa as the place is not accessible by car. You just need to call them. My friends and I really enjoyed our stay here. I would definitely recommend this place if you'll be going to Ubud! A huge thanks to the male receptionist Deyan, manager Dewa, and the rest of the staff! We have had a wonderful stay at Masia Villa in the middle of the rice fields. From beginning to end totally satisfactory. The staff, the view, the tranquillity, everything and everyone is so friendly and inviting. The breakfast is wonderful as well. Please keep in mind that you cannot reach the premises by car, but the staff will pick you and your luggage up by scooter and whenever necessary they take you down to town and back up to the hotel, which takes less than 5 minutes. Very centrally located. We are now in Seminyak and already miss this place. Wonderful!!! Hotel doesnt have parking area. Need to call the staff to take us with motobike to the hotel. On the second day we got dirty sheets, lots of mosq in the room. But bfast was good.